All the drama surrounding what would become of Brett Favre is now finally over. It was recently announced that Favre will be wearing the green and white for the Jets instead of the Green and Gold for the Packers. It is unfortunate that things had to end the way they did. 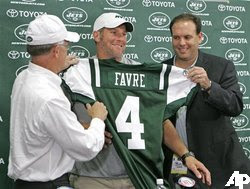 It will be hard to watch Favre play for a different team, and we hope Rodgers can do his job for the Packers. The Packers have also postponed the retiring of Favre's jersey that was suppose to take place during their opener against the Vikings. That day will come once Favre actually retires.